Stress, bowel disorders and a poor diet can damage the cellular lining of the intestines, allowing toxins, bacteria, waste and food particles to leak through. 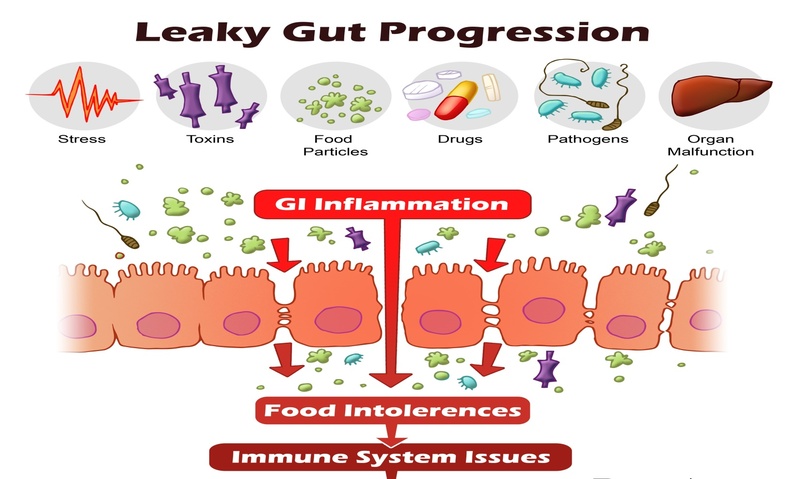 Leaky gut syndrome, also known as intestinal permeability, may lead to bowel disorders, poor nutrition, Crohn’s disease, and inflammation. .The intestinal walls are lined with villi, which absorb nutrients through Tight Junctions. However, as the villi become more permeable, large proteins slip into the bloodstream and triggers an immune response, which can then cause food allergies and further inflammation. Tests exist that detect the symptoms of leaky gut. The Lactulose Mannitol Test (LT) or Polyethelyne Glycol (PEG) test administers two sugars a lactulose solution and mannitol into the body. If test shows a higher than normal lactulose and mannitol in the body, this means the body is not absorbing them, which is an indicator of leaky gut. The doctor can follow up with a treatment regimen to reduce inflammation. Improper digestion of sugars: The most common sugar that is poorly digested is lactose, the sugar in milk (lactose intolerance). Testing also may be used to diagnose problems with the digestion of sucrose, fructose and other sugars. bacterial overgrowth of the small bowel, a condition in which larger-than-normal numbers of colonic bacteria are present in the small intestine. if individuals have abnormally rapid passage of food through the small intestine, there may not be enough time for the small intestine to digest and absorb sugars and carbohydrates. This results in the entry of larger amounts of sugar and carbohydrate into the colon where the bacteria can digest and convert them to gas. The Hydrogen Breath Test measures levels of hydrogen in the breath to diagnose several conditions that cause gastrointestinal symptoms. In humans, only anaerobic bacteria in the colon can produce hydrogen. These bacteria produce hydrogen when they are exposed to unabsorbed sugars and carbohydrates (not proteins or fats). Large amounts of hydrogen may be produced when there is a problem with the digestion or absorption of food in the small intestine that causes unabsorbed food to reach the colon. Large amounts of hydrogen also may be produced when the colon bacteria backflow into the small intestine, a condition known as bacterial overgrowth of the small bowel. When the backflow bacteria are exposed to unabsorbed food that has not had a chance to completely traverse the small intestine to be fully digested and absorbed, some of the hydrogen produced by the bacteria, whether in the small intestine or the colon, is absorbed into the blood flowing through the wall of the small intestine and colon. The hydrogen-containing blood travels to the lungs where the hydrogen is released and exhaled in the breath where it can be measured. Research indicates that a large number of Americans suffering from abdominal pain, bloating, diarrhea, and other guts issues, were found to have bacteria that are normally found in the large intestine backed up into the small intestine. There appears to be a strong correlation between this situation and Irritable Bowel Syndrome. Once diagnosed, the condition can be treated, patients with this condition have experienced welcome relief from their symptoms. Similarly, accurate diagnosis of one or more of the sugar intolerances can lead to development of a treatment plan that can greatly diminish painful digestive reactions to lactose, fructose, or sucrose. The test is simple, non-invasive, patient-friendly and is performed after a short period of fasting (typically 8-12 hours).